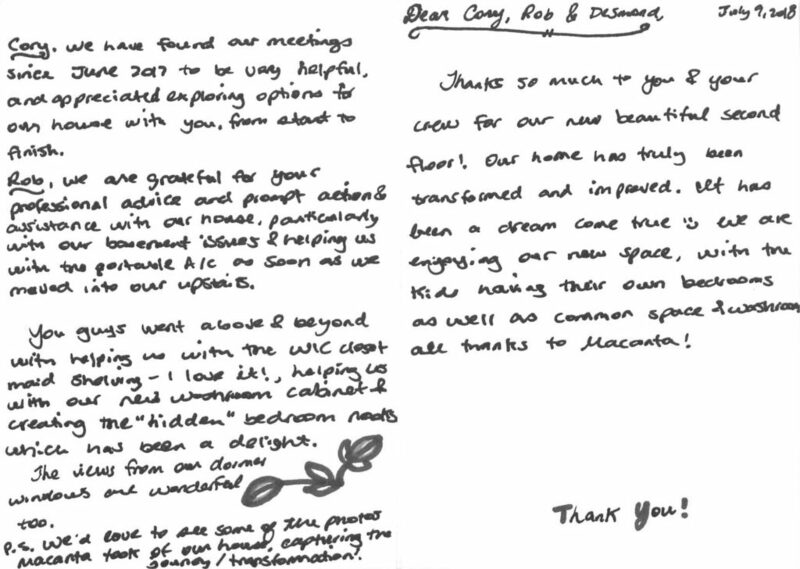 Second Story Addition - Thank You Card | Macanta Design Build Inc. Sometimes checking the mail brings along with it a pleasant surprise, such as the following thank-you card we received earlier this month. We at Macanta are constantly in Awe of the AWESOME clients we get to work with. Thanks so much to you & your crew for our new beautiful second floor! Our home as truly been transformed and improved. It has been a dream come true 🙂 we are enjoying our new space with the kids having their own bedrooms as well as common space & washroom all thanks to Macanta! Cory – we have found our meetings since June 2017 to be very helpful, and appreciated exploring options for our house with you, from start to finish. Rob – we are grateful for your professional advice and prompt action & assistance with our house, particularly with our basement issues & helping us with the portable A/C as soon as we moved into our upstairs. You guys went above & beyond with helping us with the WIC closet maid shelving – I love it!, helping us with our new washroom cabinet & creating the “hidden” bedroom nooks which has been a delight. The views from our dormer windows are wonderful too. P.S. We’d love to see some of the photos Macanta took of our house, capturing the journey / transformation!